A library classification is a system of knowledge organization by which library resources are arranged and ordered systematically. Library classifications use a notational system that represents the order of topics in the classification and allows items to be stored in that order. Library classification systems group related materials together, typically arranged in a hierarchical tree structure. A different kind of classification system, called a faceted classification system, is also widely used which allows the assignment of multiple classifications to an object, enabling the classifications to be ordered in multiple ways. The library classification numbers can be considered identifiers for resources but are distinct from the International Standard Book Number (ISBN) or International Standard Serial Number (ISSN) system. The Name Authority File is an authority file of people, which served primarily to access literature in libraries. The PND has been built up between 1995 and 1998 and was published by the German National Library until 2012. For each person there is a record with his or her name, birth and occupation connected with a unique identifier, the PND number. The Subject Headings Authority File or SWD is a controlled vocabulary index term system used primarily for subject indexing in library catalogs. The SWD is managed by the German National Library (DNB) in cooperation with various library networks. The inclusion of keywords in the SWD is defined by "Rules for the Keyword Catalogue" (RSWK). 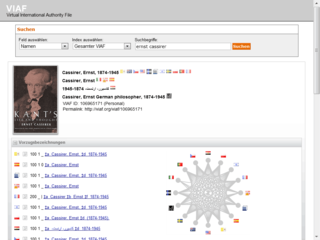 Similar authority systems in other languages include the Library of Congress Subject Headings (LCSH) and the RAMEAU. Since April 2012 the SWD is part of the Integrated Authority File. A statutory corporation is a corporation created by the state. Their precise nature varies by jurisdiction, thus, they might be ordinary companies/corporations owned by a government with or without other shareholders, or they might be a body without shareholders that is controlled by national or sub-national government to the extent provided for in the creating legislation. Florentine Lahme is a German actress. Knowledge extraction is the creation of knowledge from structured and unstructured sources. The resulting knowledge needs to be in a machine-readable and machine-interpretable format and must represent knowledge in a manner that facilitates inferencing. Although it is methodically similar to information extraction (NLP) and ETL, the main criteria is that the extraction result goes beyond the creation of structured information or the transformation into a relational schema. It requires either the reuse of existing formal knowledge or the generation of a schema based on the source data. The LC Linked Data Service is an initiative of the Library of Congress that publishes authority data as linked data. It is commonly referred to by its URI: id.loc.gov. ↑ GND Ontology – Namespace Document Archived 2013-01-03 at the Wayback Machine ., version 2012-06-30.